Hope that y'all have a great Oct 31. 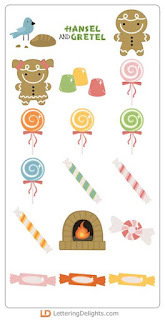 LD has a very cute freebie for us this week but first, did you see their new Hansel and Gretel collection? There are some seriously cute images in the release. 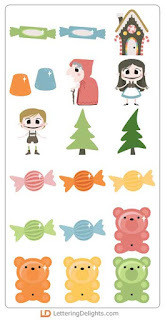 CLICK HERE to see the whole Hansel and Gretel collection. CLICK HERE or the image above to go to the LD site. 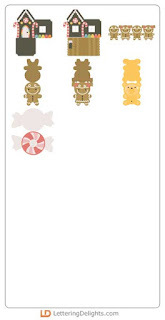 Add the Hansel and Gretel - Lollipop Covers to your cart and checkout. You pay $0.00! If you have not seen LD's latest release, hurry up and run over to their store now. The new collection is too cute! 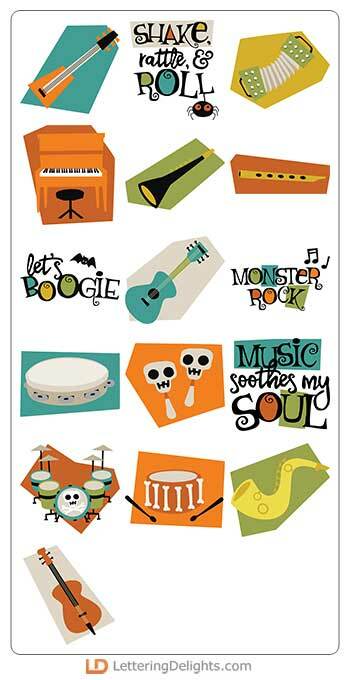 Here are some of the designs in the Boogie Bash collection.CLICK HERE TO SEE THE WHOLE LINE. CLICK HERE or the image above to go to the LD site. 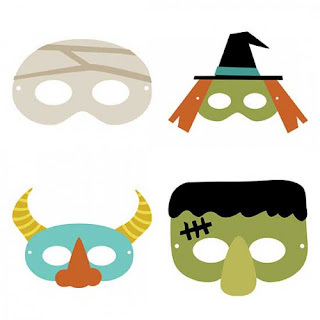 Add the Boo-gie Bash - Masks (printable) to your cart and checkout. You pay $0.00! When LD released their Simply Spooky collection the other day, I knew I just had to cut out those Cameos. 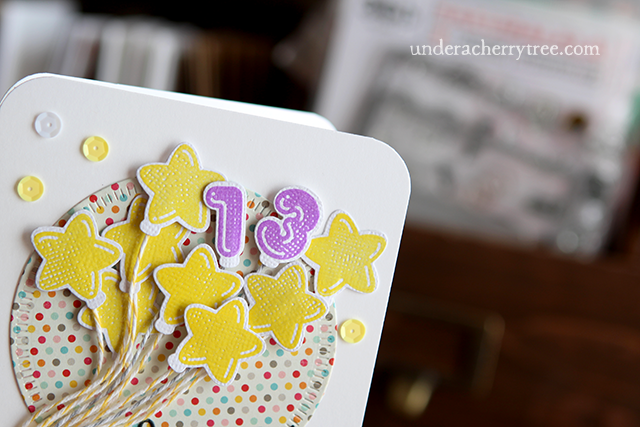 I've always enjoyed using the LD Simple Shapes- they are so easy to put together (Only 1 layer!) but so versatile! 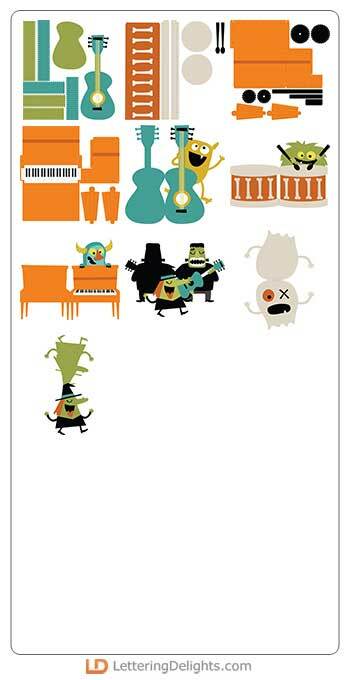 CLICK HERE to see some of the projects that I have made using Simple Shapes. 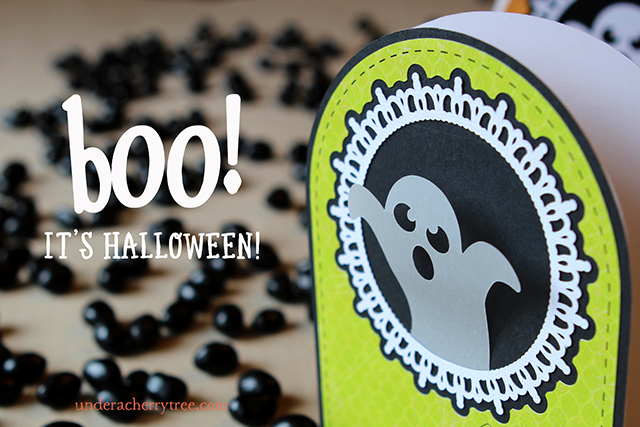 The Simply Spooky - Cameo Simple Shapes are no exception. 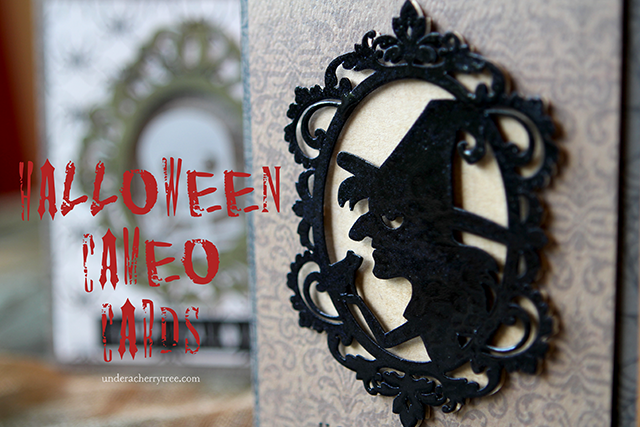 They may look intricate but my Silhouette Cameo cut them out easily. For the two cards that I am sharing today, I actually cut each of the simple shapes 3 times and layered them together to add some dimension. 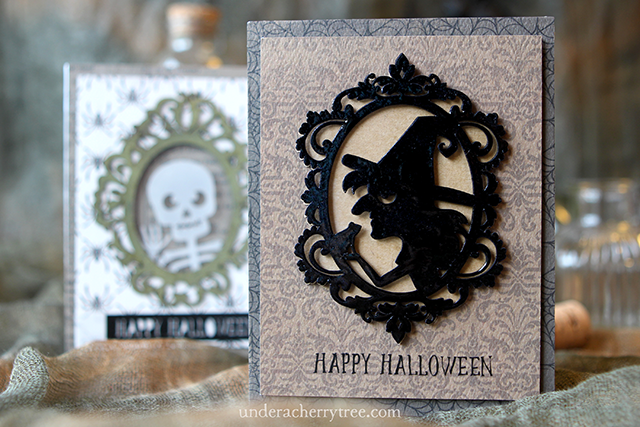 I also heat-embossed the top layer of the witch cameo with black embossing power to add texture to the card. As much as I like the simplicity of the Simple Shapes, sometimes I just want to add a little color to the design. 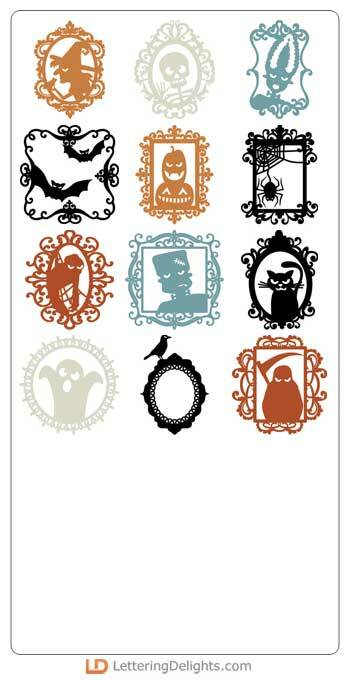 For example, I wanted the skeleton to look out of a colored frame, just like the style in the Simply Spooky Graphic Set. 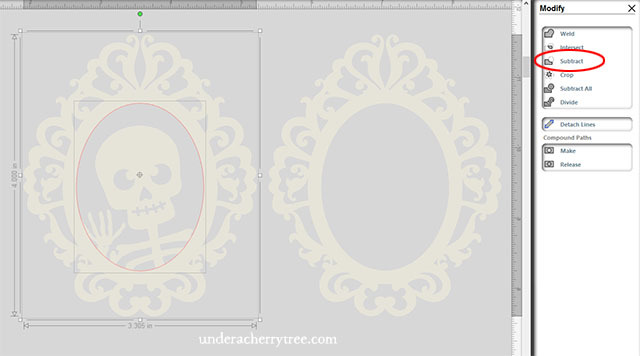 Since there is no corresponding Cut Set for those graphics, I used Silhouette Studio to remove the skeleton from the frame. I am using Silhouette Studio v2.9.67d (a.k.a. Legacy version). If you are using a different version of the software, your screen may look different from mine but you should still have the MODIFY tool in your program. One more thing... the greeting on both cards were cut out from a scrap piece of vinyl that I had leftover from a previous project. I used the vinyl cut-out on one card and the negative for the other. 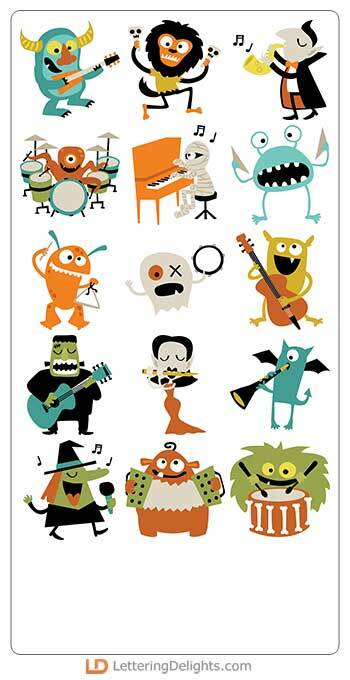 Halloween is just a little more than two weeks away and LD has a great freebie for us that we can all use on Oct 31st. But first, let's take a look at their new releases. There is a new graphics/cut set collection and a new font bundle in the LD store. 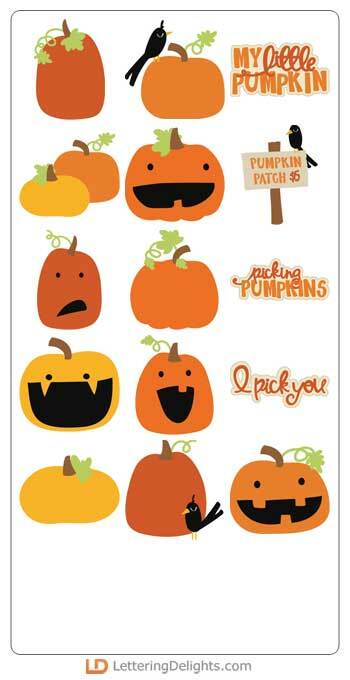 CLICK HERE to see the new Pumpkin Patch collection and font bundle. 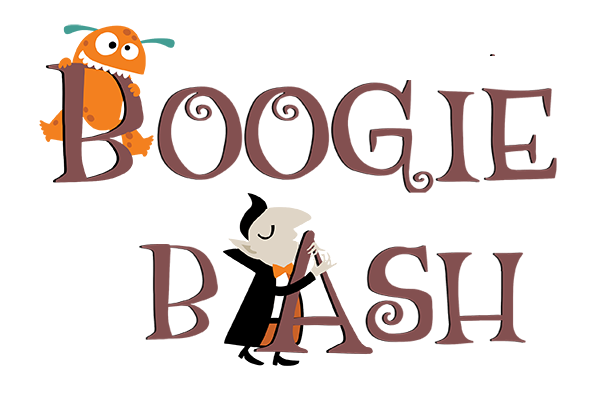 While you are there, check out their Boo Sale. 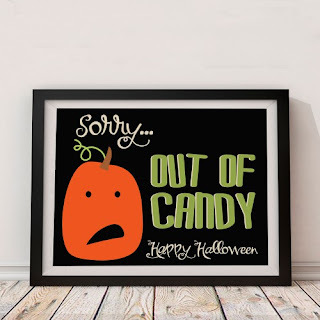 Many Halloween designs are marked down to 75% off the regular price! CLICK HERE TO SHOP THE SALE. CLICK HERE or the image above to go to the LD site. 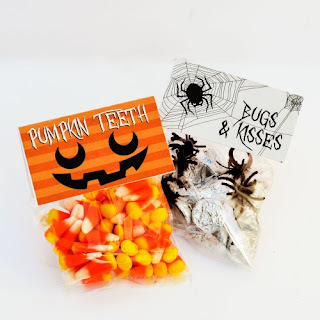 Add the Pumpkin Patch - Out of Candy (printable) to your cart and checkout. You pay $0.00! In my previous post I mentioned that I had made a couple of cards prior to my Summer vacation but had forgotten to post them on the blog. I showed you some of them yesterday that were super easy to make. 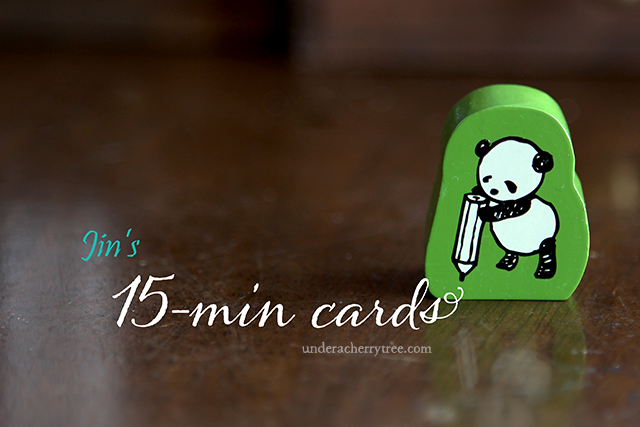 Here are a few that took a little longer to put together and so I didn't include them in that "15-min cards" article. 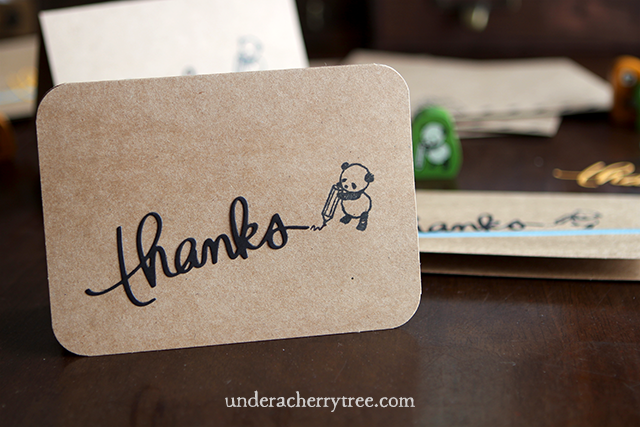 First up is this "Thank You" card. 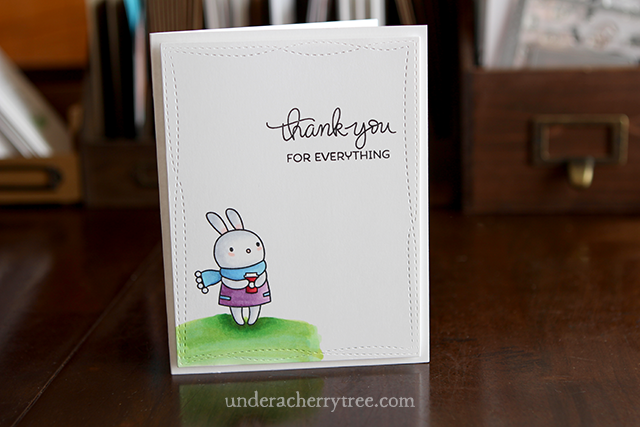 I wanted the "Thanks scallop border" die as soon as I saw it on the Simon Says Stamps website. Isn't it pretty? I don't use stamps that require coloring very often but when the mood strikes, I always find myself reaching out for a Mama Elephant stamp. My favorite part about this bunny is that coffee cup. So so cute! A lot of my twin daughters' friends are turning 13 this year and I had made this birthday card with one of their friends in mind. I ended up not giving it to her. Instead, I got my daughter to make her a card herself but I did lend her the stamps. Hehe. That's all for now. Hope you enjoyed the cards! While looking through the photographs that I took on our recent vacation to Singapore and Japan, I came across a couple that were of cards that I had made prior to the trip. I had originally intended to post these as pre-scheduled blog posts but I was so busy preparing for the trip that I never got around to doing that. And so here they are. I'm posting them a lot later than I had intended but like they say, it's better to be late then never. 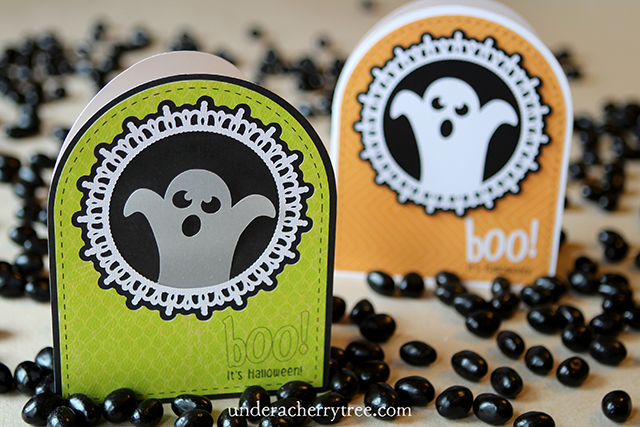 These cards, like my Easy Die-Cuts Cards, were made in 15-mins or less. 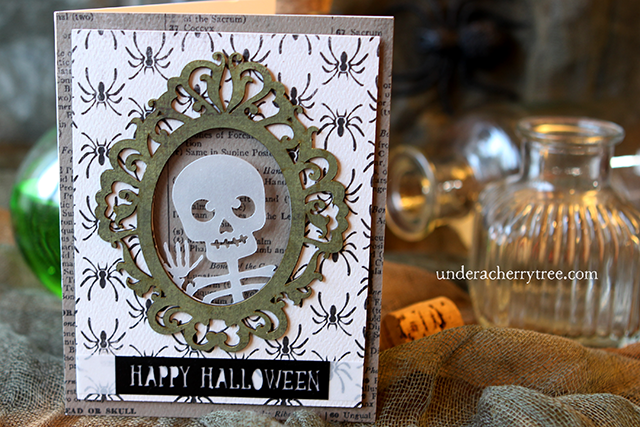 I used a simple rubber stamp by Kodomo No Kao and metal dies by Mama Elephant. 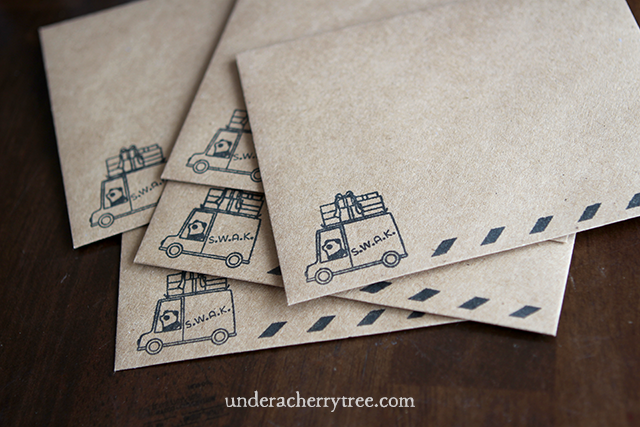 The stamps that I used for the envelopes are also by Mama Elephant. p.s. I am not affiliated with Kodomo no Kao, or Mama Elephant. I love the simplicity of this card. The stamp alone is too cute and I love that I can use it with any sentiment to send a message. 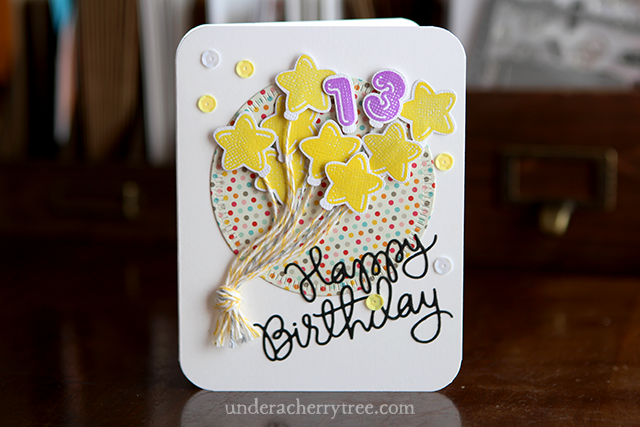 To add some color to the cards, I used a strip of washi tape. 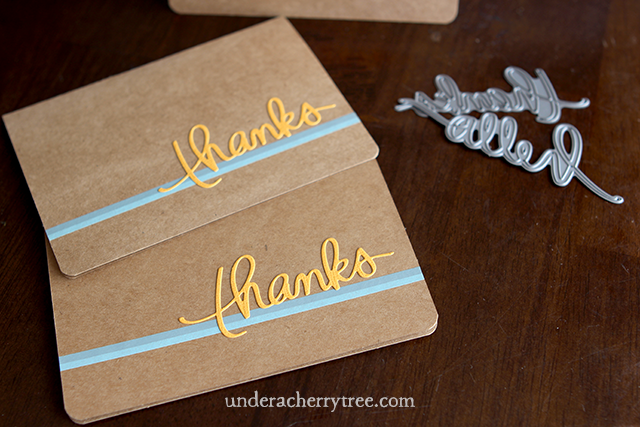 The word "thanks" was cut out using a metal die and my Sizzix Big Shot. A panda card must have a panda envelope to go with it, right? I can't tell you how much I adore the panda stamps at Mama Elephant. I *heart* them a lot! 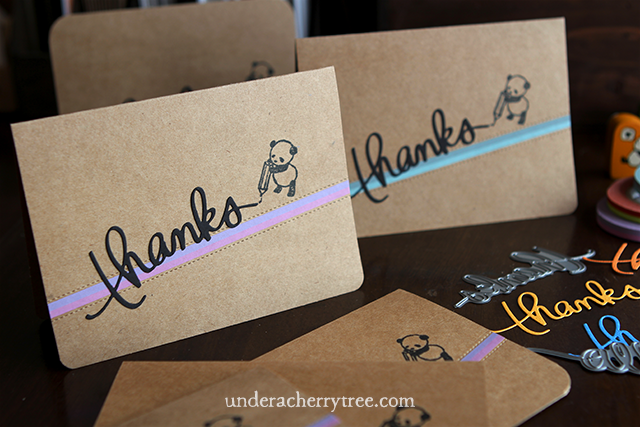 For a less cutesy look, I left out the panda stamp and just used the die-cut with washi tape to make some quick Thank You cards. I never seem to have enough of those. 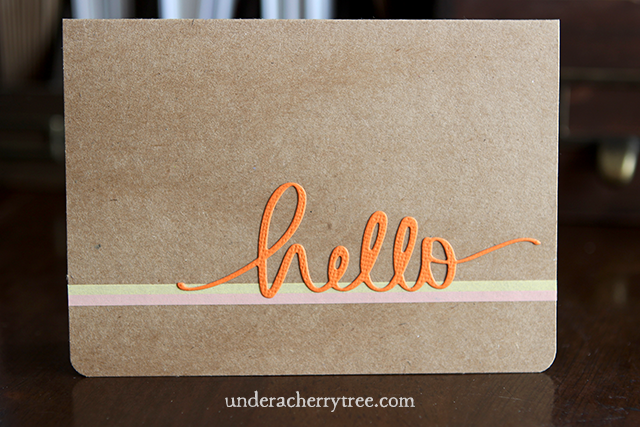 I also made a few easy note cards by replacing the "thanks" with a simple "hello". 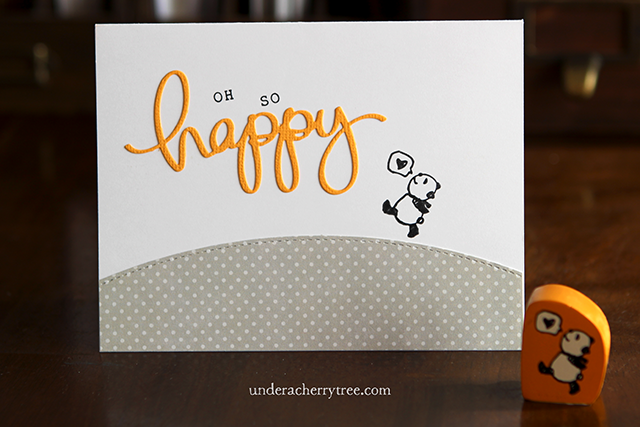 I am a hoarder of craft supplies and it is such an irony that some of my favorite cards are the ones that are super simple, like this "OH SO happy" card. I used scrap pieces of cardstock to cut out the "happy" and the hill. The "OH SO" letters were stamped using a set of alphabet stamps. I hope that you enjoyed these cards. I have a few more that I will be posting later. Look! These are Simple Shapes! I *heart* Simple Shapes because they are so easy to use! 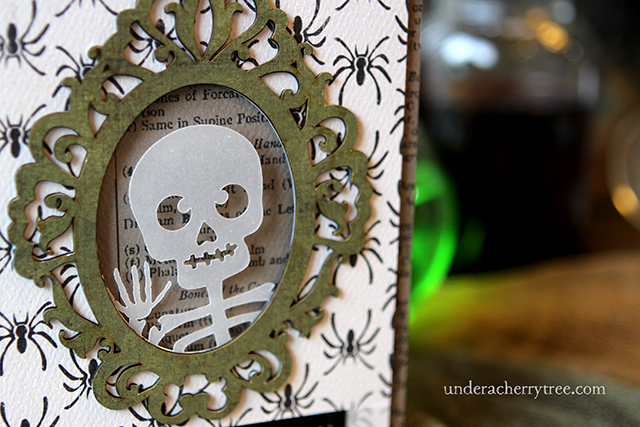 Cut them out of paper to make some easy cards or cut them out of vinyl for some quick home decor. Check out these Simple Shape Cameos. 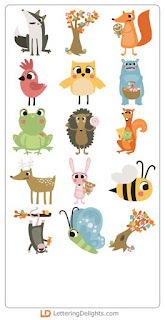 They would look awesome as wall decals! 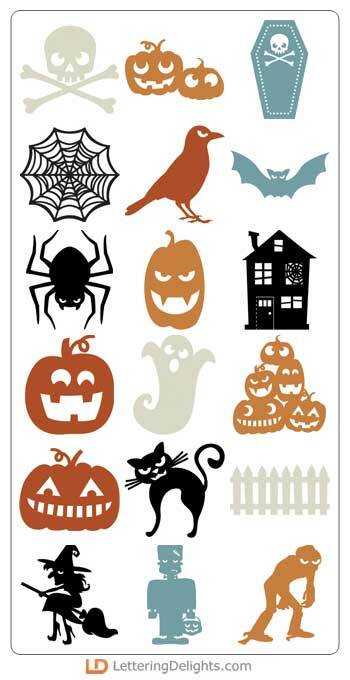 Speaking of home decor, these Halloween houses would be so fun to make and display. That skeleton looks like a fun idea too. 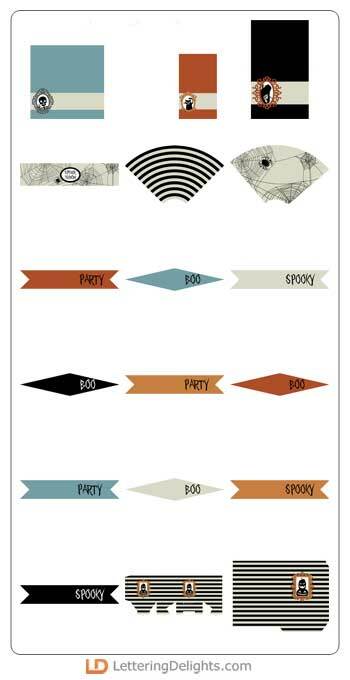 If you are planning a Halloween party, use the Simply Spooky Party printable set to make the party look even more awesome. 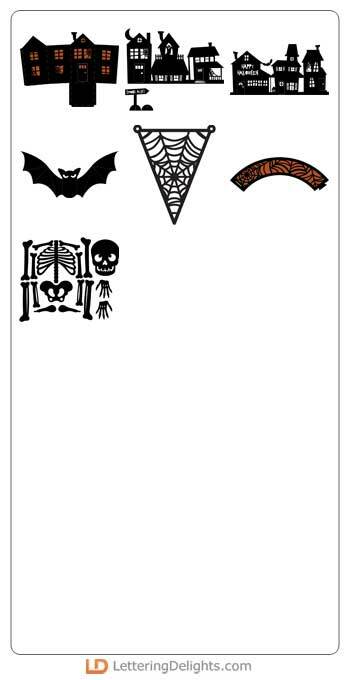 These are just some of the designs in the Simply Spooky collection. CLICK HERE TO SEE THE WHOLE LINE. 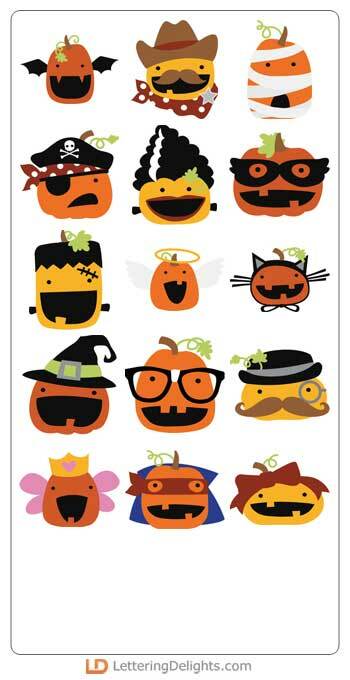 The LD Boo Sale is still going on and many Halloween designs are marked down to 75% off regular price. CLICK HERE TO SHOP THE SALE. 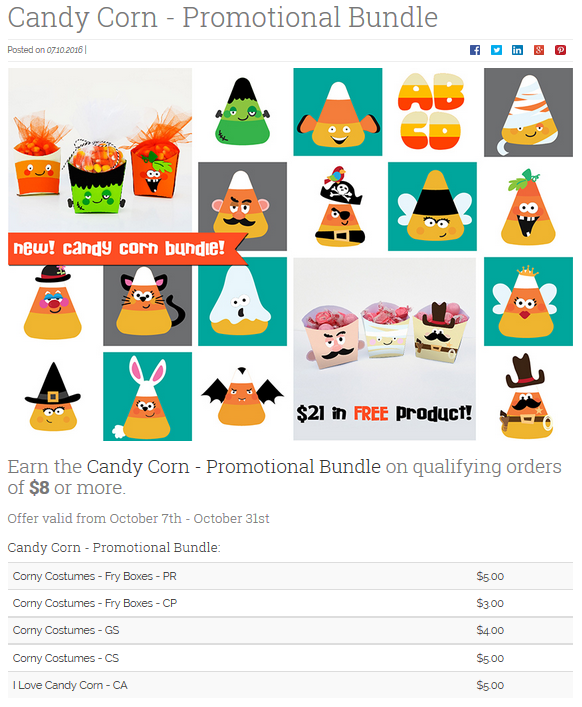 While you are at the LD store, don't forget to grab this month's LD Promotional bundle. CLICK HERE or the image above to go to the LD site. 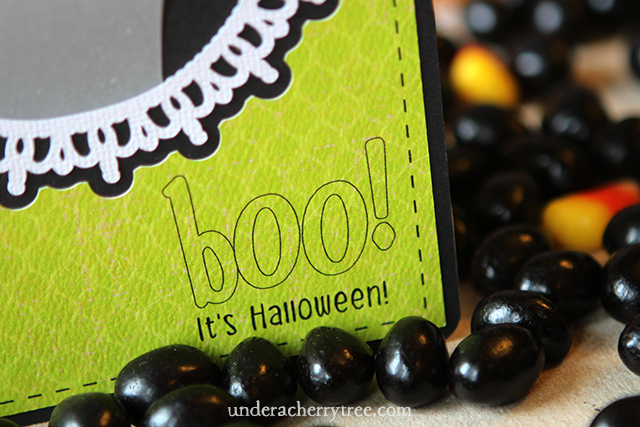 Add the Simply Spooky - Bag Toppers (printable) to your cart and checkout. You pay $0.00!